Anti-Trump protesters were blocking vehicles leading into Fountain Hills in advance of Donald Trump’s campaign stop Saturday morning. 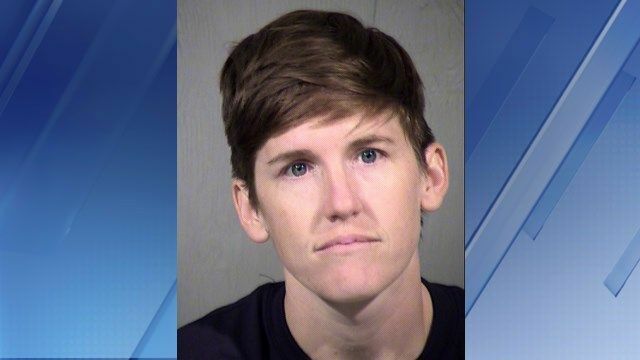 Three protesters were arrested, Maricopa County Sheriff Joe Arpaio said. The sheriff's office said Sunday their names are Steffany Laughlin, who goes by Ben, Jacinta Gonzalez and Michael Cassidy. "We had a little problem," Arpaio told the crowd gathered in Fountain Hills. "Demonstrators were trying to disrupt.Three of them are in jail. If they think they’re going to intimidate you the next president of the U.S., it’s not going to happen." For hours, the protesters - about two dozen in total - parked their cars in the middle of the road, unfurling banners reading "Dump Trump" and "Must Stop Trump," and chanting "Trump is hate." Traffic was backed up for miles, with drivers honking in fury. The disruption occurred well after large crowds lined up to get into the Fountain Hills rally. Maricopa County Sheriff Deputy Joaquin Enriquez said officers will ask the protesters to move and if they don't comply, they will forcibly remove them. Maricopa County sheriff's deputies were seen directing tow trucks to start hauling the violators away. 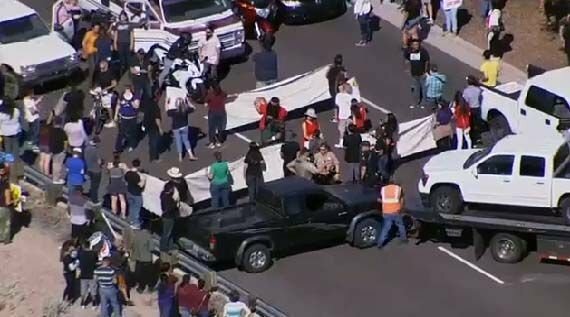 Arizona Department of Public Safety troopers pulled up to assist deputies at Shea Boulevard and State Route 87, where protestors, standing shoulder-to-shoulder, maneuvered their vehicles to block traffic. Arizona Republican Party Chairman Robert Graham issued this statement in the wake of the protest:"These protesters are denying our First Amendment rights by physically preventing innocent people from attending a rally held by a candidate for public office. I won't stand for it nor should anyone in America. This is an outrageous display, and it's deeply offensive to me as a voter and as a party leader to see these tactics here in Arizona. We trust our voters and we trust law enforcement and our judicial system to ensure no voter is intimidated or blocked or suppressed or prevented in any way from exercising his rights to vote and to enjoy free speech." Demonstrators also marched through a crowd that gathered at the edge of a park in Fountain Hills just before Trump arrived. The protesters, who earlier had blocked the main highway leading to the event, were outside the perimeter set up by the Secret Service around the main rally site but still surrounded by thousands of Trump backers. Deputies with the sheriff's department were posted throughout the park, on rooftops and on patrol. Deputies wearing bulletproof vests stood alongside a Humvee with a gun turret on top. Trump told the crowd that he is "winning by massive landslides" and vowed to rebuild the military and build a border wall with Mexico. He drew cheers from the crowd when he vowed to protect the Second Amendment - which for pro-gun Arizona is a particularly important issue. Trump supporters waved signs saying "Hillary for Prison" - referring to Democratic front-runner Hillary Clinton - and "Joe for VP," a reference to Arpaio. Earlier in the morning, protesters were lining up in Phoenix in advance of Donald Trump’s appearance at a campaign event at the Phoenix Convention Center. Trump was appearing with Sean Hannity at 9 a.m. for a town hall meeting. Protesters were staging in Tonatierra Park and planned to march to the event in a peaceful protest. They were carrying a message they want Trump to hear. Protesters will march several blocks to where Trump will speak. Trump is bringing his get-tough message on illegal immigration to Ground Zero. "He’s already talking about building walls, not bridges. In the modern era, that’s not acceptable," Reza said. Trump supporters trickled through protesters and security to attend - many wearing red, white and blue. Kitson said the wall Trump vows to build all along the Mexican border may or may not be realistic, but it "is getting people's attention." Another Trump supporter, Tim Tashio, weighed in. "I want him to undo all the things the previous administration has forced upon us,’" Tashio said. Another supporter said Trump is a leader. "Something we sorely need in this country now," Frank Tortorici said. "He says what he needs to say." Following the downtown event, Trump will hold a rally Saturday at 11 a.m. at a park in Fountain Hills, the hometown of Sheriff Joe Arpaio. The lawman is a Trump ally known for immigration crackdowns that made him politically popular, but they were eventually barred by the courts. Hundreds of immigrant rights advocates who have opposed the sheriff's tactics plan to line up outside the Trump event. They will be joined by members of a union that represents hotel workers and military veterans who say Trump is using hateful speech toward Muslims. Francisca Porchas, organizing director for the Puente Movement, a civil-rights group in Phoenix, said her group sees Trump's views on immigration as being the same as the sheriff's. "We want the Trump rise -- the Trump effect -- to end," Porchas said. Copyright 2016 KPHO/KTVK (KPHO Broadcasting Corporation). All rights reserved. The Associated Press contributed to this report.